The Tollund Man is the name for a mummy which was found in Denmark, in the 1950s. The man lived in the 4th century BC, in what is known as the Pre-Roman Iron Age. The head and face were so well-preserved that he was mistaken at the time of discovery for a recent murder victim. Twelve years before the discovery of Tollund Man, another bog body, Elling Woman was discovered in the same bog. Below the body was a thin layer of moss. Scientists know that this moss was formed in Danish peat bogs in the early Iron Age, therefore, the body was suspected to have been placed in the bog more than 2,000 years ago during the early Iron Age. C14 radiocarbon dating was performed: It indicated that he died in approximately 375-210 BC. The acid in the peat, along with the lack of oxygen underneath the surface, had preserved the delicate soft tissues of his body. Examinations and X-rays showed that the man's head was undamaged, and his heart, lungs and liver were well preserved. The Silkeborg Museum estimated that he must have been approximately 40 years old, and about 1.61 m (5 ft 3 in) tall, at the time of his death. This means he was relatively small, even for the time. It is likely that the body had shrunk in the bog. On the first autopsy report in 1950, doctors concluded that Tollund Man died by hanging rather than strangulation. The rope left visible marks in the skin beneath his chin and at the sides of his neck. There was no mark, however, at the back of the neck where the knot of the noose would have been located. After a re-examination in 2002, forensic scientists found more evidence to support these findings. Although the cervical vertebrae were undamaged (as they often are in hanging victims), radiography showed that the tongue was distended—an indication of death by hanging. The stomach and intestines were examined and tests carried out on their contents. The scientists discovered that the man's last meal had been a kind of porridge made from vegetables and seeds, both cultivated and wild: barley, linseed, gold of pleasure (Camelina sativa), knotweed, bristlegrass, and chamomile. 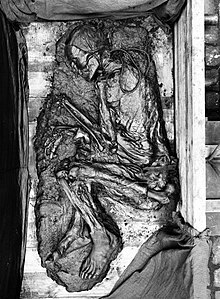 Bog bodies dry up and decompose rapidly, when they are taken out of the bog. Because of the facial expression, and the general state of the head, the decision was taken to expose the body. At the time, the head was preserved using Polyethylene glycol, the only material available. This method did not permit to preserve the body; it dried up and decayed. Today, the head is attached to a copy of the body. Both feet and the right thumb were also in a good state of preservation when the body was found in the 1950s. For this reason, they were kept in formaldehyde for analysis later. In 1976, the Danish Police Force made a finger-print analysis, making Tollund Man's thumb print one of the oldest finger-prints on record. Tollund Man is exposed in the Silkeborg Museum. ↑ 1.0 1.1 1.2 1.3 1.4 Silkeborg Public Library, Silkeborg Museum (2004). "A Body Appears". The Tollund Man - a face from prehistoric Denmark. Silkeborg Public Library. Retrieved 22 September 2007. This page was last changed on 27 October 2017, at 09:12.